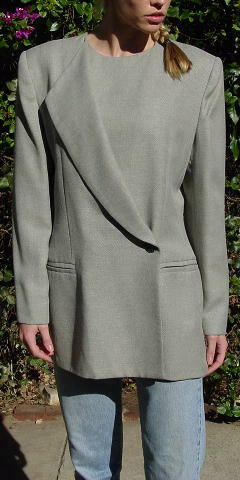 This vintage jacket is 60% rayon and 40% acetate. It has a black 100% acetate lining. It has a black background with a pattern on tiny connected white V's in row after row. It has no collar, and the left front top connects under the right side (by two snaps) to give it a rounded neckline. 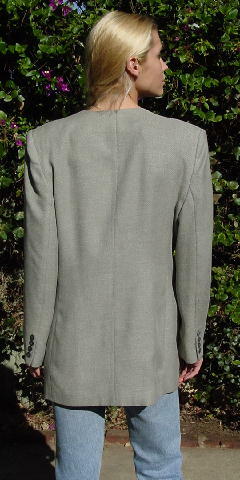 The right side has one long lapel which stops above the one gray and pearlized button. The long sleeves each have 4 smaller versions of the same buttons. There are 2 front slash pockets, still sewn shut. There are 2 additional front snaps which help to keep the jacket closed. It belonged to a larger size New York model. shoulder to hem 29 1/2"
armpit to armpit 20 1/4"